As a full-time working mom and wife I often feel that I'm lacking in the time- and energy departments - there's just so much to be done, ya know? But then I meet a woman like Tasmyn Oberholster, who, on top of working full-time and being mom to Ethan (6) and Owen (3), just oozes energy and a positive attitude. Oh, and she runs like a champ too. Let me introduce you. Tasmyn, who works as a PA and Office Manager for an online marketing company, lives in Table View, Cape Town. She started running in 2011 with the aim of getting fitter and healthier and today, a whole 18 kg lighter, has not only reached and exceeded her goals, but also built up a valuable network of running friends, and earned herself an impressive medal collection in the process. Such an inspiration! Running the Race (RtR): Are there any obstacles that you have had to overcome or that you are still overcoming in order to be able to run? If yes, how do you overcome these obstacles? Tasmyn Oberholster (TO): At first I had the weight issue. Running with the extra weight was tough, but I persevered and the running took care of the extra kilos... I run as often as I can. I have a full time job, a husband (who is SUPER supportive of my new-found hobby) and two very busy little boys. 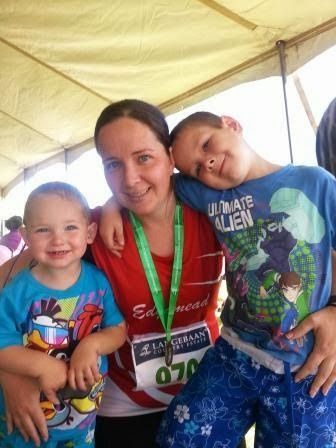 I try to juggle my time in order to get in at least one race per weekend and one day of family time. I also encourage my kids to run and take part in the kids' running events and they love it, especially the medals (I think they get that from me!). I love watching them achieve their very own little goals. However, my boys will only be young for so long so I want to make the most of my time with them for now, so when they are older, I will have all the time in the world to run. The road will always be there...! RtR: When do you usually run (time of day) and why? 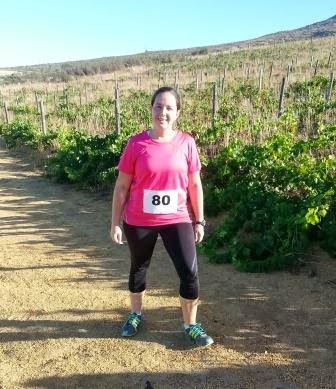 TO: Morning runs do not work for me because of family and work commitments, so I run in the evenings after 6 p.m. Every weekend I do one race on either a Saturday or Sunday morning to allow the other day for family time and sleeping in (lol!). 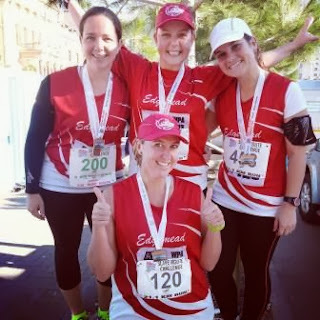 RtR: Any tips for men and women out there who want to start running, but feel that they are too slow, overweight or non-athletic? 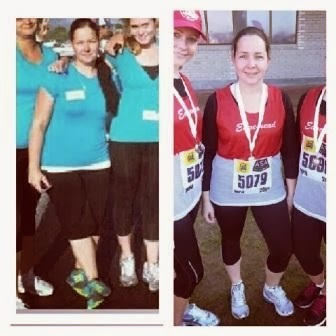 TO: I once had those exact thoughts and feelings: I put on so much weight after having my kids and I was so unfit that climbing a flight of stairs left me breathless for about five minutes! It’s a mindset that you have to change yourself - no one can do it for you. I took a before photo and stuck it up in my cupboard - every morning I woke up it was the first thing that I would see and it motivated me to make the change. I started walking, then jogging and eventually found myself running (I might run slow, but at least I run!). I've lost 18 kg in six months with small changes to my diet, but mostly because of running! I really admire two things about Tasmyn's attitude: 1) Her family and kids are still her number one priority, despite her taking the time to be fit and healthy, and 2) She placed the responsibility to change and take charge of her health squarely on her own shoulders. Love it! Thanks so much, Tasmyn, for sharing your story, and keep on being the inspiration that you are! My pleasure, Tasmyn! Thanks so much for sharing! I'm always so inspired by you moms that manage to do it all! I hope I can be like all you women whenever I have kids of my own! Amazing! Great story, wonderful woman - and just look at all those medals.... Racing every weekend indeed, puts me to shame!